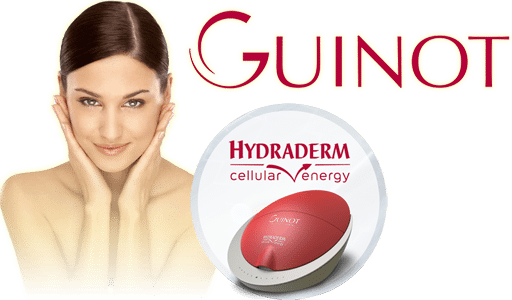 Guinot’s new, revolutionary patented machine provides the alternative to aesthetic treatments by increasing the biological and cellular activity within the skin through the use of 3 unique functions; Thermal Energy, Dynamic Ionisation and Lifting Stimulation. Using dynamic ionisation and thermal energy, this patented technology encourages the cellular energy in the skin which beautifully enhances and spectacularly rejuvenates the complexion. This unique treatment allows you to achieve exceptional, visible and clinically proven results after just one treatment. Clinically proven to improve wrinkle depth by up to 49.5%, this specially designed anti-aging Hydradermie Cellular Energy Facial focuses on the eyes, face, and neck to target signs of aging. This effective lifting treatment stimulates the facial muscles using a low frequency current which causes atoning action, stimulating the muscle fibres in the skin leaving a smoother, firmer and more youthful appearance to the complexion. A combination of the Hydradermie Cellular Energy Youth and the Hydradermie Cellular Energy Lift Express. The instant Eye Repair Treatment. 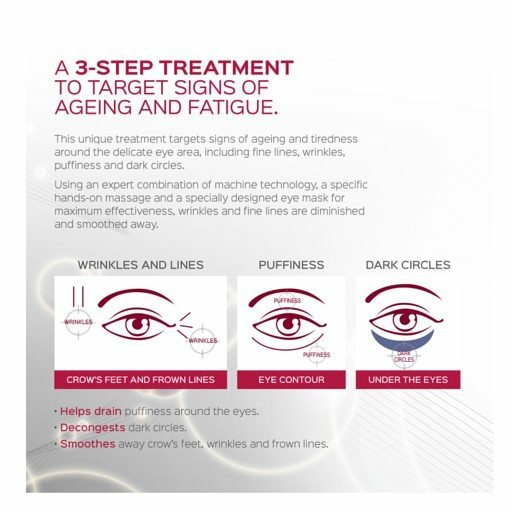 This unique treatment targets signs of aging and tiredness around the delicate eye area, including fine lines, wrinkles, puffiness, and dark circles. Using an expert combination of machine technology, a specific massage and a specially designed eye mask soaked in a concentrated skin repair serum for maximum effectiveness. Specifically targeted manual facials to achieve visible and immediate beauty results from Guinot. The Ultimate Anti- Ageing Facial The pinnacle of anti-aging treatments, Age Summum, uses pure Vitamin C, Hyaluronic Acid and Pro-Collagen to target the signs of aging. Active ingredients are penetrated into the skin using the exclusive Age Summum anti-ageing facial massage. Fine lines and wrinkles are smoothed and the skins youthful radiance is restored.. The unique, personalised treatment method combines the benefits of essential oils with massaging techniques to fill your skin with energy and provide a long-lasting effect. Concluding with an Aromatic Mask your skin will recover its natural radiance. The “peeling” treatment removes dull skin cells, letting the glow of new cells shine through. The fruit acids penetrate dead cells and the pure Vitamin C mask regenerates the elastic fibres, enhancing a natural glow and lightening the skin. One treatment will restore a radiant complexion, while a course of three will reduce pigmentation marks on the skin, eliminating excess dead cells and allowing the skin to breathe again. Cellular renewal is accelerated, revealing a more youthful and radiant complexion. Liftosome is a treatment completely dedicated to the firmness and youthfulness of the skin, due to the key active ingredient: Pro-Collagen concentrate, as well as the modeling effect of the Thermolift Mask. It redefines the skin and tightens the features. The Liftosome treatment recreates the youthfulness and firmness of your face by diminishing signs of aging. The treatment furthermore restores radiance and vitality. Book your Guinot Facial now. Call (+44) 020 8788 5619 or press the button below.